GOSPELflava.com recently took time out to chat with Take 6’s Joey Kibble to discuss new music, the group’s new record label and Take 6’s incredible longevity. GOSPELflava.com: Most people can identify it instantly, but it’s a little harder to describe. What is your description of the Take 6 sound? Joey Kibble: What is the Take 6 sound? That is a good question. We are simply are a group of guys who sing a cappella gospel and you add in some pop and jazz sound to it and you have Take 6. And to really be honest with you, it’s just the message of the gospel over and over. That’s what we do. GOSPELflava.com: When many have shied away from the a cappella approach recently, why has that remained a focus point in your music? Joey Kibble: That’s the gift we’ve been given by God. That’s how we started. This is our strength and our focus point. We’ve noticed that people really love the a cappella sound. That’s what we did and what we do best. It’s our unique approach to music that people are used to. Our personal approach to it also makes it an intimate setting for them. We are singing without the instrument. Our voices are our instruments. 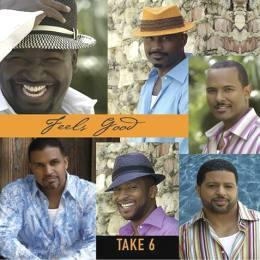 GOSPELflava.com: Your new record label, Take 6 Records, is the home to your latest album, Feels Good. Why have you started up your own company? What are the benefits? that we thought we could do it for ourselves. We knew it would be a challenge but definitely well worth it. So we decided to put our product through first. It’s our way of giving back to the people and beyond. GOSPELflava.com: Will you be adding artists to your roster, aside from yourselves? Joey Kibble: Right now it’s still a learning process for us. We haven’t gotten to that bridge yet. But once we do, we will be looking for artists who believe what we believe. When developing new artists, we simply want to help them get to where they want to go. If we do that, we’ve done our job. GOSPELflava.com: Why has Take 6 had such longevity in the industry? Joey Kibble: We are just six headstrong guys. Take 6 began to learn over a period of time. We were on a mission to accomplish. As with any group, we’ve had our ups and downs. Some guys wanted to leave the group. There had been times I wanted to leave the group but I couldn’t. That’s because God had not released me to go. And if He didn’t release me, I knew I couldn’t go anywhere. What we’ve been through as a group is special and unique. We learned that our first obligation is to God. It is Him who gave us the ability, talents and the gifting. Our longevity in the industry is completely up to Him. GOSPELflava.com: What is different about your new album, Feels Good? Joey Kibble: To start out with, it’s the writing. All the writing on this project has come from the heart. Man, the many personal issues that we have been through. I mean everything: balancing family and career. Allowing yourself to be honest enough that it speaks to people. Being honest is hard. It’s opening yourself up and to be transparent to the people you connect with. Feels Good culminates to what we’ve been through to this point. Take a look at my life. See the principle and be encouraged by it. In a lot of ways it’s more like a celebration. If no one else is touched by this music, we were and our job is complete. Since we had to go through it first (music and lyrics), we were ministered to. The lessons you learn when you are down are amazing. GOSPELflava.com: Is there any one song that you like personally? Joey Kibble: “More Than Ever”. This song came out of blood. The group, marriage, personal demons. This song talks about how God dealt with me through my issues. When you are stripped down to nothing at the bottom, that’s when He can begin His work. It was then when He started building me up. And He has been strengthening me every single day since then. GOSPELflava.com: What song was most difficult for you? Joey Kibble: Again, it would be "More Than Ever”. But if I had to choose another, it would have to be "Lamb of God". Again it’s about being honest. This time we had to be honest righteousness. This is what the people need. This is what they need to hear. GOSPELflava.com: Who do you listen to? Joey Kibble: Everything! You have to. I like J. Moss. He is talented and his gifting, wow! Stevie Wonder is still one of my favorites. Who else? I like James Taylor, Daryl Coley, The Winans, Anthony Hamilton. In hip-hop, I like “Jesus Walks” by Kanye West. There is just something about that song. The way the song was given, I saw where he was coming from. GOSPELflava.com: Who is the biggest Gospel artist and hidden talent? Joey Kibble: You know, that’s hard to say. Anybody could be. Anyone who can connect to the masses for whatever period of time. We judge by various standards. So, you just can’t call it. GOSPELflava.com: What would people be surprised to know about Take 6? Who is the joker in the group? Who is the serious one? Joey Kibble: Ced is the biggest joker of our group. He will mock you to a tee. He’s what we call “The Doctor” of the group. I have become more serious, especially recently. But Vin is serious; he is in law school. Vinny will always come through for you. GOSPELflava.com: Who haven’t you worked with and want to? Joey Kibble: Aretha and Tina! [Aretha Franklin and Tina Turner] When they open their mouths, my God. It’s something about when they open their mouths it just brings you to tears. They would take Take 6 to another level. GOSPELflava.com: What’s next for you guys? Joey Kibble: Building up the label right now. Building up the label, promoting the project and touring this summer. There are no limits on what we can do and what we will do. Our only guarantee to anyone is that God’s not gonna stop doing His thing. You never know where God is going to take you and us. We never thought we would be having our own label. So look at God.